An Italian Lidl from the 'glass palace' era, here in Verona. Newer stores may look a bit less showy since Lidl is keeping a close eye on costs. Lidl has inaugurated an upgrade to its Italian store concept. A new outlet in Via Pietro Giordani in Milan represents an architecturally elaborate, metropolitan store concept. Located in a formerly abandoned business zone, the store area covers 1,400 square metres on the first floor with 110 parking spaces on the ground floor beneath. The outlet fulfils all standards of modern green building requirements. According to press reports, the concept has also been taken to Bologna and Verbania, Piedmont. Changes to the 2,000-item assortment have been minimal but the presentation has been improved, particularly for special interest ranges. Wellness, organic, fresh, vegan and the premium Deluxe lines have been highlighted, and the Lupilu baby range has seen a complete overhaul. 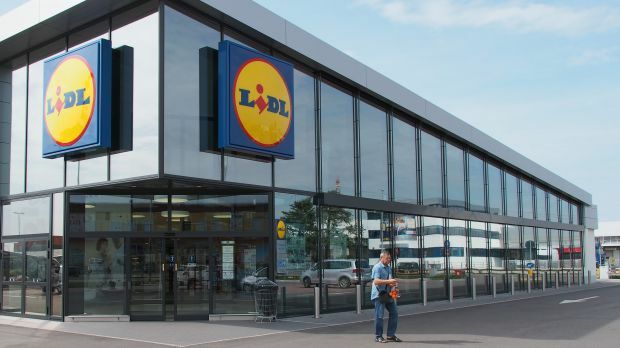 It comes as no surprise that Lidl’s new Italian concept was revealed just a few days ahead of rival Aldi Süd’s launch into the market, set for 1 March (also the first day of Lidl’s new business year, by the way). This time the new concept may not really be a completely new concept but rather an update on previous amendments. We may recall that it was in Italy where Lidl presented its European, no, even global store template in late summer 2015, the concept that it took to the United States. Since then a few things have changed – most notably the cost constraint and spending cuts that were decreed around a year ago. In real estate, of course, changes such as these take a while to implement. This type of metropolitan store is anything but easy and straightforward to build – with a car park underneath and escalators to the first floor. So, concessions to architecture are being made, in order to get back into city centres as the suburbs and outlying areas have already been taken. This coincides with politicians all over Europe seeking to reduce land consumption in urban areas (Aldi Nord has pledged to build multistorey homes with stores on the ground floor in Berlin, for example). But the instore experience has now reverted to a more efficient, demure look and feel, following years of increasing opulence. The wines, for example, are once again presented on plain shelves rather than in wooden crates, like they were in the 2015 concept. Other elements, such as customer toilets, have been kept. Aldi Süd, meanwhile, when it begins opening its first Italian stores later this week (most of them not far from the Lidl outlet), will have almost reached the scope of Lidl in terms of offer. Aldi Italia will feature some 1,900 SKUs, which compares with 2,000 for Lidl. Aldi Italia will have separate areas instore for antipasti and Italian specialities, mimicking the look of neighbourhood butchers and grocers. Aldi is following Lidl on the supermarketisation journey, extending its ranges and offers and upgrading its stores, while Lidl has already paused in order to avoid its costs going through the roof. Of course, both discounters are no longer solely focused on entry-price ranges, but also on the quality competition. Aldi’s welcome offers for Italy include at least two thirds local specialities and regional brands. This cannot be to Lidl’s liking. In GDO Week, Emilio Arduino, Head of Real Estate and Central Services at Lidl Italy, put it this way: “Lidl is an Italian company, present in Italy for 25 years with a completely Italian board; it’s the others who will have to demonstrate they can communicate with the Italian consumer.” - Aldi may still be less Italianised. But, after all, Aldi may claim it has always had the perfect-sounding Italian name.